Northwell Health and NYC Health + Hospital leaders: (from left) Dr. James Crawford, Dr. Dwayne Breining, Dr. David Battinelli, Robert Stallone, Jack Phillips (Roche Diagnostics CEO), Richie Seaberg (Northwell) and Kenra Ford (NYC H+H). 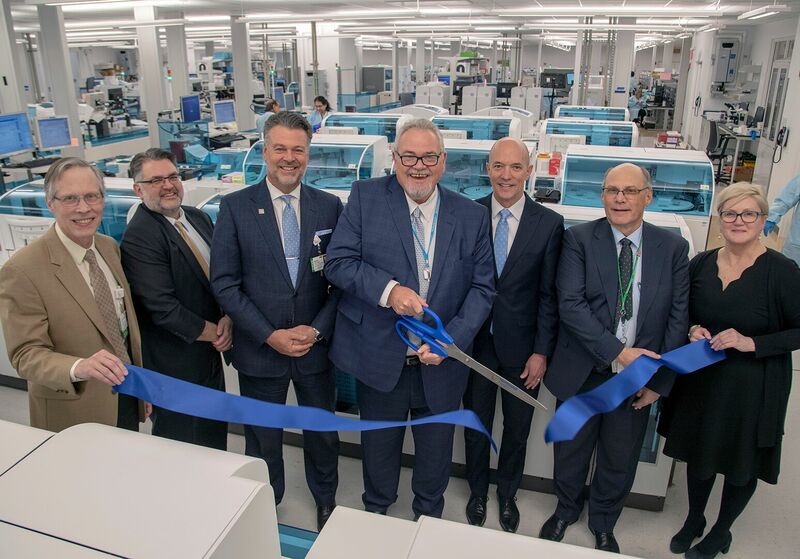 Northwell Health has opened a $59.6 million, 101,000-square-foot Core Lab within its Center for Advanced Medicine (CFAM) that features North America’s biggest Roche Diagnostics automated testing line of its kind – and one of the biggest in the world. The project is part of the Clinical Laboratory of New York (CLNY) Alliance formed in 2014 by Northwell and NYC Health + Hospitals to integrate laboratory services. The fully automated lab, located at 450 Lakeville Road, is housed inside a 1.5-million-square-foot, former military industrial complex that served as the first headquarters of the United Nations and Sperry Corporation, which manufactured advanced gyroscopes and aviation systems for US military aircraft during World War II. After an extensive two-year renovation, the space is once more home to innovation, thanks to the Roche system, which nearly quadruples the testing volume of Northwell’s Core Lab, which was previously located at 10 Nevada Drive in Lake Success. The new facility is capable of processing 5,000 tubes per hour and 55 million annually. “This new home is the culmination of over 20 years of growth in our laboratory services, and positions us extremely well for providing high quality health care in the future for patients in both of our health systems and those served through our outreach programming,” said James Crawford, MD, senior vice president of laboratory services at Northwell Health. Serving 23 hospital-based labs, 27 patient service centers and with a systemwide workforce of 2,100, Northwell Health Labs has grown to become the largest health system-based, integrated lab in the Northeast. Systemwide, Northwell Labs’s capacity has grown to accommodate more than 200,000 surgical specimens and currently performs more than 30 million tests each year between its Core Lab, hospital-based testing, nursing homes and clinical trials. “We are very excited that the new technology in these labs enables us to more efficiently provide more timely and accurate testing for all of our patients, which leads to better care at a lower cost,” said Dwayne Breining, MD, executive director of laboratory services at Northwell. The new facility is the second major lab that Northwell and NYC Health + Hospitals has opened this year. In early February, the two organizations also partnered to build a $47.7 million shared, centralized laboratory in nearby Little Neck, Queens. The Queens facility is the largest nonprofit, hospital-operated lab in the nation, featuring the nation’s largest Kiestra Microbiology automated line. The 36,000-square-foot, LEED Silver-certified center performs microbiology tests, including molecular diagnostics, from local hospitals, clinics and physician offices.